One of my most read posts is the one I wrote about "How To Be A Great Roommate." Of all of the things on my blog it makes me laugh that that post is constantly getting traffic. 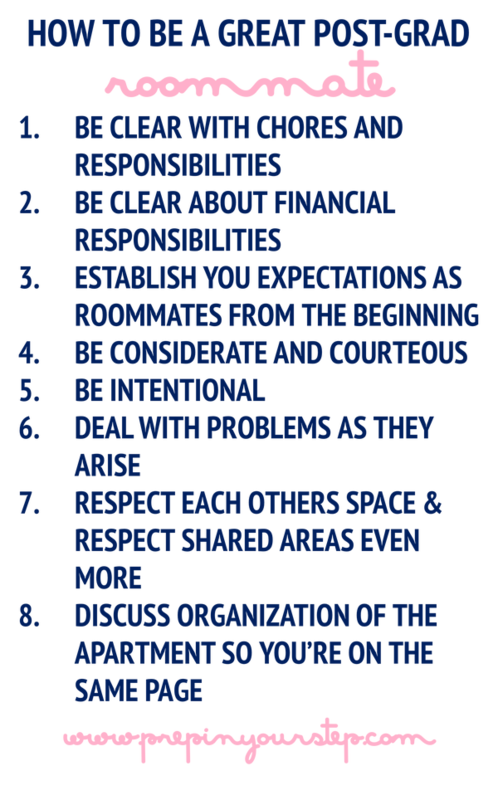 While I included details about some of the things you may not think about when it comes to living in a dorm with another person it all boils down to one thing, respect. As long as you respect the space you share, your roommate, and each others time and belongings things should work out even if you are not the best of friends. I have found that living with other people outside of a dorm and on campus apartments works in a similar way with a few differences, but the respect component remains the same. 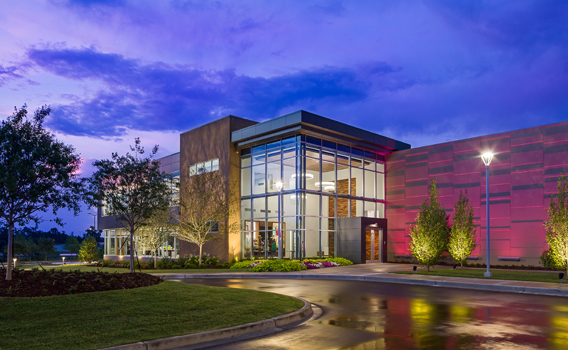 At Furman, where I went to college, we were required to live on campus all four years. So, this is the first year that I have lived in an apartment off campus since taking a job in Greenville. I still live with two other Furman girls but our apartment set up and what we've gotten used to is completely different than it was when we called Furman home. Now instead of a four bedroom apartment with two bathrooms we live in a three bedroom apartment with two bathrooms. We have laundry and a dishwasher directly in our apartment and our schedules are very different than they once were while we were in college. I may be in the minority when it comes to post grad roommates since all of my roommates and I are teachers so we have pretty similar schedules. I feel like that is not normally the case and would require a bit more consciousness towards one another than is needed in our situation since we are all up before 6 am and tend to be asleep before 11 pm. 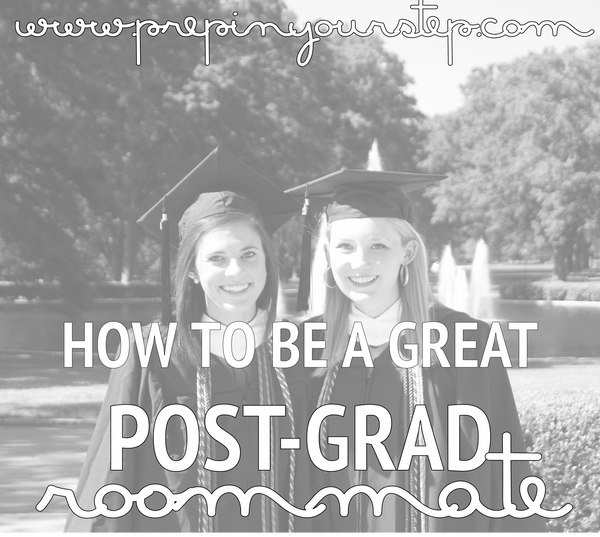 Whatever your situation may be here are some tips I have that will help you to be a better post-grad roommate and even help out those of you still in college. While I do enjoy cleaning I don't want to be doing it all the time and nor do my roommates. By breaking up who is going to vacuum, empty the dishwasher, stiffer, and clean the bathroom we are able to have a clean apartment without having to do it all individually. We are still working on coming up with a system for this but are pretty good about cleaning up on Sunday's. Taking out the trash and emptying the dishwasher is a bit more difficult to schedule since it's usually whoever finds that it needs to be done does it but coming up with a chore chart or some system will also help with tasks like this. Living with other people definitely lessens your financial responsibility since you are able to split wifi and energy costs not to mention the cost of rent. Making sure you split up these costs at the beginning and at the very least decide when you will be making payments to one another will help you to not have to confront your roommates about money as that can be a touchy topic. It is also more than likely that your roommate(s) has a different salary than yours so being conscious of how things will be paid is important. Going into the living situation with clear expectations as roommates will make the situation better. You don't need to lay out whether or not you're going to be friends but instead need to discuss how you would like to live. Do you like your space to be hot or cold? Do you want to host friends to your apartment or solely use it as a space to decompress after a long work week? Do you love to cook and plan to use the kitchen a lot? Little things like this being discussed at the beginning will help the person you are living with picture what living with you may be like. By picturing how you are living together with realistic expectations from the beginning hopefully you'll be more satisfied in the long run. Caring about your roommate and what they are doing in your space is necessary for you to have a good relationship. Be considerate of them when they are sleeping. Try not to be too noisy early in the morning and late at night. If you share a bathroom try to make sure that one of you ins't taking too long making it so that the other person doesn't have enough time to get ready. Move your clothes from the washer when you are finished so that if needed your roommate can do a load of their own. The more you put into your roommate relationship the more you will likely get out of it. Be sure to include your roommate in plans on occasion or when possible. Take the time to ask them how their day was and what they are up to. If you're running to the store ask them if they'd like to join or if they need anything, this sincerity won't go unnoticed. If problems do arise or if you aren't thrilled with how your living situation is currently be sure to talk about it in a kind way with your roommate instead of letting this anger build up. Being passive aggressive is not going to help either of you in the long run. If you're frustrated make sure to calm down before bringing up the issue and be sure to try not to point fingers but instead work together to come up with a solution. Allow your roommates to do what they want in their own space. If they close the door when they leave in the morning that probably means you shouldn't go in. Self explanatory, I know but something to keep in mind. When it comes to shared space however, a good run of thumb is to try to leave it cleaner than you found it. If you make a mess in one of these areas clean it up right away instead of the other person feeling the need to clean up after you. Whether it's dishes or an unorganized living room from friends coming over you don't want to have your space a mess and your roommate probably doesn't want it to be that way either. Knowing how you plan to organize the pantry, laundry room, fridge, and any communal closets will help to make sure that no one claims more space than they should. Storing extra supplies in communal space seems fair for all and double checking to make sure that it's ok if you store your suitcase somewhere other than your room is just good practice when it comes to living with other people and being conscious of their space as well as your own. I am sure there are other tips that would be prove to be helpful but these were some of the most over arching tips I could think of. But remember, it all boils down to being respectful. I by no means am claiming that I am the easiest person to live with and definitely find myself not following some of these tips when I'm in a hurry or stressed. I'd love to hear any other tips you may have the have made your living situation after graduation better! One last tip that we were required to do as undergrads at Furman and would be helpful for those of you who may not have the luxury of living with friends you know is making a roommate contract. If you'd like to see an example of one check out this post.